Learn to make this classic dish from southern China at home – or join us on a Shanghai Night Eats food tour to sample is straight from the source. The main ingredient of this beef rice noodles recipe is he fen/hor fun wide rice noodles, which is also known as Shahe fen, originating in the town of Shahe in Guangzhou. The noodles are dry-fried (without sauce) with beef marinated in soy sauce that is first seared in the wok. Then in go the onions, beansprouts and green onions, then the noodles, dark & light soy sauce and sugar. Nothing too hard, even for the inexperienced home chef. Give it a try! 1. Rinse beef and dry with paper towels. Thinly slice across the grain. Mix with marinade for 15 minutes. Set aside. 2. Heat cooking oil (soybean or canola oil is recommended) in a frying pan over medium-high heat. Place beef on a single layer and fry both sides, until they are 70% cooked. Set aside. 3. Heat more oil in pan. Add onion and stir fry until translucent. Be sure not to burn them. Add ginger and bean sprouts. 4. When the bean sprouts are softened, push the onion and bean sprouts to the sides of wok if it’s big enough, or dish them up if your wok is too small. 5. Increase heat to high. Toss in flat noodles and stir fry until it’s really heated up. Add seasonings and taste. Add more light soy sauce if needed, bit by bit at a time. If you find the color of flat noodles is not dark enough, you can add more dark soy sauce if you like. 6. Toss the beef, onion and bean sprouts back in the wok and combine all ingredients. Add spring onion and mix. Serve immediately. 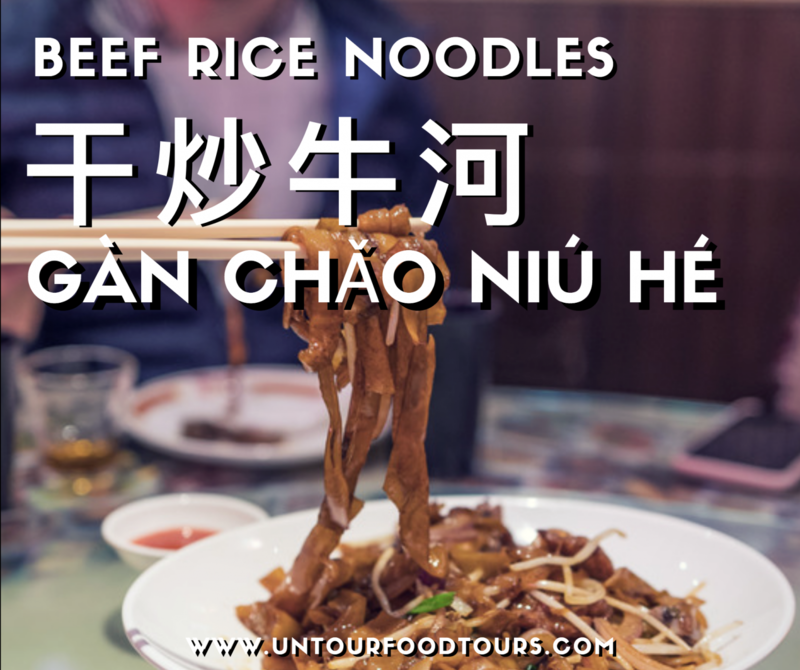 If you enjoyed this beef rice noodles recipe, join us to taste it and more than 15 other tastings on our Shanghai Night Eats food tours route – you’ll get to taste authentic flavors from regional cuisines around China. Local spirits, beer & soft drinks are all included.